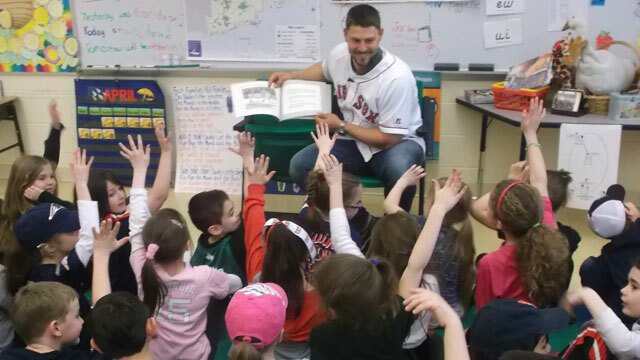 The tenth annual Trenton Thunder Gift of Baseball program begins today, giving fans the chance to share the experience of cheering on the hometown team with underprivileged families in our community. For each Season Ticket, Pic-A-Plan and Mini Plan purchased between November 24 and December 19, the Thunder will provide tickets for families in the Holiday Gift Outreach program run by Children’s Home Society to attend a 2015 Thunder game. In its first nine years, the Gift of Baseball program has allowed the Thunder to donate a total of 6,344 tickets to the Children’s Home Society. The Children’s Home Society of New Jersey provides at-risk children and their families with a range of services that empower them to achieve their potential. They are child-oriented, family focused, community based, and outcome-oriented. The Thunder will begin the 2015 season at ARM & HAMMER Park on Thursday, April 16 against the Portland Sea Dogs (Red Sox). Single game tickets will go on sale in March 2015. For more information about tickets, fans should call 609-394-3300 or visit TrentonThunder.com. 5th Grader from Assumption B.V.M. School in West Grove, PA chosen out of thousands of entries. 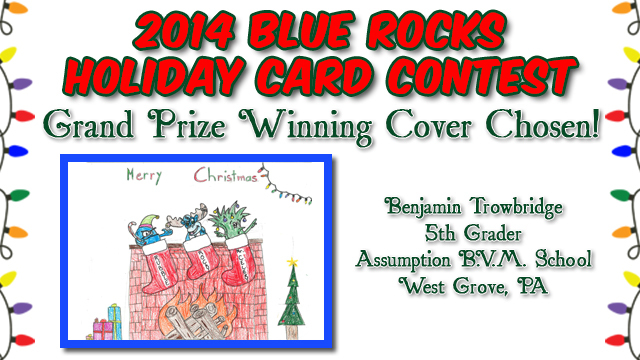 The Wilmington Blue Rocks are excited to announce the winner of the 13th Annual Holiday Card Contest. Thousands of entries were received, but unfortunately, there could be only one winner. After a tough decision process, Rocky Bluewinkle, Mr. Celery and the rest of the Holiday Card Contest Committee decided that the overall winner was Benjamin Trowbridge, a 5th Grader from Assumption B.V.M. School in West Grove, PA. His artwork will be featured on the cover of the Wilmington Blue Rocks Holiday Card. Benjamin will be rewarded with a team-autographed baseball, a ceremonial first pitch and 10 tickets to a 2015 Blue Rocks game. Each entrant will be rewarded with 2 tickets to a Blue Rocks game in 2015 as a thank you for participating. The tickets will be mailed to the participating teachers by February. The Blue Rocks, who drew 284,701 fans to Frawley Stadium in 2014 and averaged more than 4,400 patrons per game, have season seats and group packages for the 2015 season on sale now. Fans should call 302-888-BLUE or visit BlueRocks.com for more information. Thunder & NJM Score For T.A.S.K. 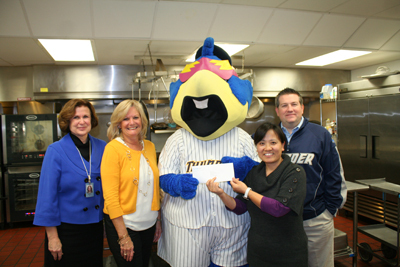 (Caption:) Paying a visit to the Trenton Area Soup Kitchen (TASK) along with Boomer, the Trenton Thunder mascot, are, from left, Patricia Hartpence, Assistant Vice President for Corporate Giving, NJM Insurance Group; Cindy Berger, NJM’s Community Outreach Events Coordinator; and Will Smith, General Manager and Chief Operating Officer of the Thunder. Boomer hands NJM’s donation check to Xiumei Chen, Manager of Finance and Administration for TASK. The Trenton Thunder, the Double-A affiliate of the New York Yankees, scored 298 runs on their way to 31 victories at ARM & HAMMER Park this season, but the real winner this season was the Trenton Area Soup Kitchen (TASK) thanks to NJM Insurance Group and their Safe at Home program. As part of the Safe at Home program, NJM made a $14,900 donation, based on $50 per run scored at ARM & HAMMER Park, to TASK. With this season’s donation, NJM’s Safe at Home program has donated more than $45,000 to local non-profits over the last three years. The 2015 season, the 22nd in franchise history, will begin on April 9 at Erie with the home opener scheduled for April 16 against the Portland Sea Dogs. Season tickets and group outings are on sale now by calling 609-394-3300. For the full schedule and more team information, please visit trentonthunder.com. 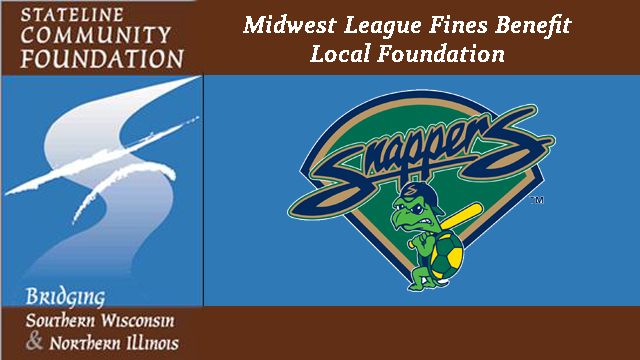 The Beloit Snappers have selected the Stateline Community Foundation to receive the donation resulting from the Midwest League’s On-Field Behavior Policy. The League splits up the amount of player fines it collects evenly between all 16 teams in the league. This year the Snappers will donate its share, $529.00, to this great charitable organization. Each season, the Midwest League asks its member teams to select a deserving group or organization in their respective community to receive a portion of the money collected from fines handed out as part of the league On-Field Behavior Policy. Past organizations selected have included Beloit Turner High School Baseball Program, Big Brothers Big Sisters, the Beloit Memorial High School Baseball Program, Beloit Youth Hockey Association, Stateline Youth Sports Complex, Rock County Habitat for Humanity, the YMCA’s Partners of Youth Program, Caritas Inc., and Hands of Faith. This annual contribution is just one of the many ways the Snappers and Midwest League Teams make efforts to give back to their communities. The Snappers are very involved in the Stateline Community, donating to hundreds of different causes each and every year. This article originally appeared on the official website of the Beloit Snappers. Click here to view the original story. 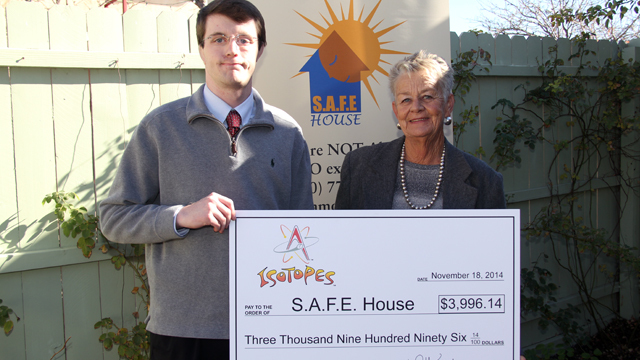 The Albuquerque Isotopes presented a check in the amount of $3,996.14 to S.A.F.E. House Domestic Violence Shelter on Tuesday, November 18th with funds raised from the “Dodger Blue” weekend jersey auction. In recognition of October as “Domestic Violence Awareness Month,” the Isotopes held an online auction from October 17-24 for their “Dodger Blue” jerseys, many of which were game-worn. Bids were received nationwide with Alex Guerrero garnering the highest overall bid at nearly $220. Although most of the bids were from New Mexico, winning bids were also received from Arizona, California, Georgia, Maryland, Utah and Wisconsin. Traditionally donned by Albuquerque during weekend home games, the jersey featured “Isotopes” script lettering across the front with the Topes’ “A” logo on the right sleeve and the Los Angeles Dodgers’ “LA” logo on the left sleeve. Holding the donation check are (from left to right) Genesis Health Services Foundation Executive Director Missy Gowey, River Bandits owner Dave Heller, and Genesis Health System Vice President, Corporate Communications, Marketing and Advocacy Ken Croken. 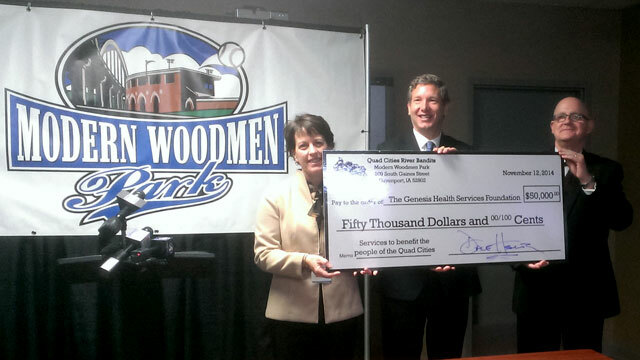 With a portion from each of 68,000 rides of the new amusements this season at Modern Woodmen Park – including the 105-foot Ferris wheel, the expanded 300-foot zip line, Space Camp gyroscope and the Mediacom Drop’N Twist – the donation will benefit Genesis Health Services Foundation health initiatives for children, including the Flu-Free Quad Cities campaign, Camp Genesis for kids who have someone close to them with cancer and Genesis Neonatal Intensive Care services to help struggling newborn babies. “By their conduct here, the Quad Cities River Bandits and their owner, Mr. Dave Heller, have helped define corporate social responsibility for our community,” said Ken Croken, vice president of corporate communications, Genesis Health System. On May 24, with an Inaugural Ferris Wheel Ride event and fundraiser, the Quad Cities River Bandits became the first team in Minor League Baseball to open a Ferris wheel inside its ballpark. Towering 105 feet above the playing field, the Ferris wheel was part of the debut for a full lineup of amusements that opened every weekend, including non-game days, for the Quad Cities community to enjoy through November 1. The Ferris wheel was named Monday as the Best Ballpark Improvement in all of baseball for the 2014 season by Ballpark Digest. It followed a year in which Modern Woodmen Park drew its largest average attendance – 3,885 per game – in the history of the 83-year-old ballpark. The holidays are right around the corner and the Charleston RiverDogs, the Lowcountry’s professional sports leader, has orchestrated three community-involved programs to help those in need. Beginning on Tuesday, November 18 from 9 am – 6:30 pm, the club will host at Joseph P. Riley, Jr. Park a clothing donation drive for Palmetto Goodwill. While the RiverDogs will make a significant clothing donation, the club’s staffers will also clean out their own closets and donate items to Goodwill. Fans are invited to stop by Riley Park and donate some of their clothing to Goodwill, and we’ll treat you to a cup of free hot chocolate and a voucher for a game in 2015. The RiverDogs’ popular mascot, Charlie T. RiverDog, will be on hand and will donate a bag of his clothing. Charlie also encourages other local mascots to join in the activities. Then on Friday, Nov. 21, beginning at 12 noon, the club will host its annual staff/ RiverDogs Potluck Lunch. This year the Potluck Lunch will also be a food drive in conjunction with the Lowcountry Food Bank. In this, the RiverDogs invite their season ticket holders and many loyal fans to The Joe to spend “Thanksgiving” with us as we collect food. Those who come are encouraged to bring a food dish and canned food for the drive. 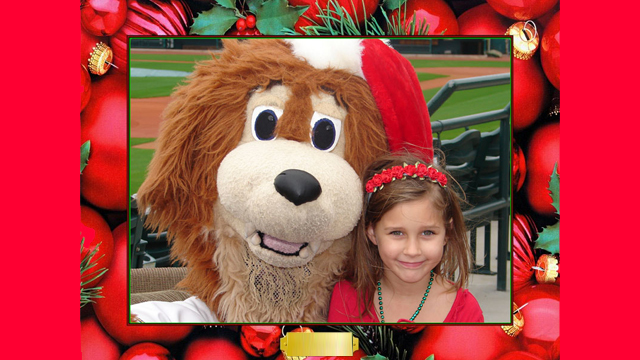 A RSVP is requested to haley@riverdogs.com. And finally on Saturday, December 13 beginning at 11 am, the RiverDogs will offer the opportunity kids and fans to have pictures taken with “Charlie Claus” and Santa as the team hosts a toy drive in conjunction with the Salvation Army. Here, families may come to The Joe and have their kids get a free picture with Charlie and Santa Claus. In order to get a picture taken, one must donate a child’s new toy to the Salvation Army. At the event, Christmas music will be played over the park’s public address system, vendors will be on hand with their goods set up on tables. There will also be a special Christmas-themed craft section and the popular bounce house will be open. Light snacks and hot cocoa will also be available. And as a bonus, the RiverDogs will donate $1 for every Kids Club Member who attends the event. Santa will only be at The Joe for a limited time. For more information on these events, please contact Haley Kirchner at 843/577-DOGS (3647). 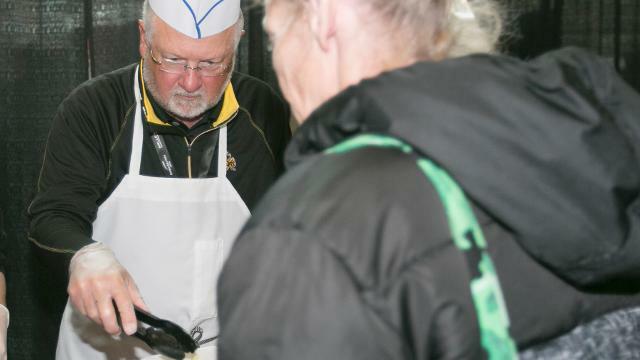 The Kane County Cougars, along with the South Elgin Lions Club, have formally kicked off the 2014 Winter Coat Drive at Fifth Third Bank Ballpark. The Cougars have been proud partners with Lions International for many years and beginning on November 11, both the Cougars and Lions International are counting on fans’ generosity this holiday season. Fans are asked to bring a gently-used winter coat or winter outerwear item to the Cougars’ administrative office lobby (2-story glass building located next to Gate 3) between 9 AM and 5 PM Monday-Friday. In conjunction with the South Elgin Lions Club, the Cougars are collecting items that will be donated to area families who are in need this winter. Fans who donate an item will receive one undated ticket voucher, valid for a 2015 regular season Cougars game. All donated items will be given to area families who are in need this winter. The Cougars are requesting that items be donated by Friday morning, December 19. Fightins General Manager Scott Hunsicker made the announcement regarding the Ceremonial Flag Service now honoring World War II veterans at the Veterans Day Ceremony. 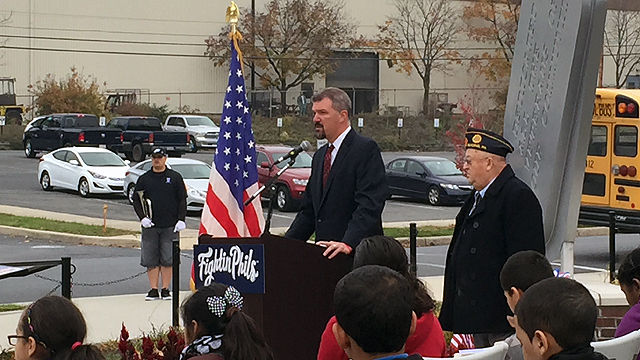 Starting with the 2015 season, the Reading Fightins, Double-A affiliate of the Philadelphia Phillies, will now be honoring living World War II veterans at each home game during the Savage61 Chrysler Dodge Jeep Ram Ceremonial Flag Service, the club announced at the Veterans Day Wreath-Laying Ceremony on Tuesday. The World War II veterans will be honored, in addition to fallen veterans of all wars, nightly during a pre-game ceremony beside their family and friends. During the ceremony, the Fightins will tell each veteran’s story and present the veteran with a Ceremonial Flag as a token of appreciation for all that they have done in protection of the United States of America. Last season, the Fightins honored fallen veterans of all wars during a pre-game ceremony by flying a Ceremonial Flag near the giant dog tags at the main entrance to honor a specific veteran each home game. Before each home game, the Fightins raised a ceremonial flag to tribute to their memory and welcomed their family to the game. The flag was then lowered and given to the family following the game. Reservations for the Savage61 Ceremonial Flag Service will be taken for the 2015 season. Those interested can call 610-370-BALL ext. 293 to reserve a date. Anyone interested in paying tribute or honor to a veteran is asked to call that number with their preference of a game date. Available game dates are filled on a first-come, first-serve basis. Over the years, the Fightins have continued to discover new ways to honor Berks County’s veterans. Originally named Reading Municipal Memorial Stadium, FirstEnergy Stadium was completed in 1951 and named in honor of the servicemen and women who risked their lives in defense of their country. 48 years later in 1999, a statue in the form of giant dog tags was placed in front of FirstEnergy Stadium in a special rededication ceremony to honor the area’s veterans. 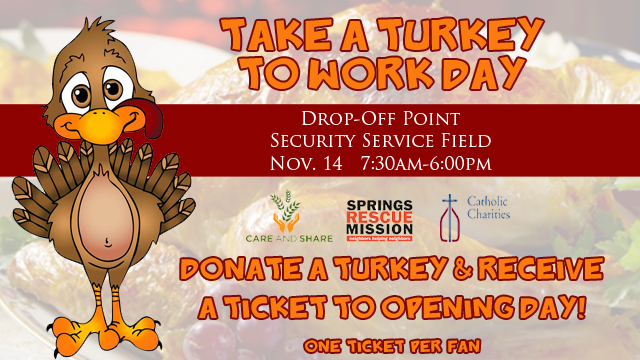 For the second year in a row, the Colorado Springs Sky Sox have partnered with Care and Share Food Bank, Springs Rescue Mission and Catholic Charities of Central Colorado’s Marian House as part of their region-wide community turkey drive for the 2014 holiday season. “Catholic Charities of Central Colorado is thrilled to join the collaboration with Care and Share, Springs Rescue Mission, and the many partners and community members who are instrumental in providing help and creating hope to those in our community who need it the most. Something as simple as providing a turkey means so much to those we serve. It allows many families and individuals to celebrate a traditional holiday, and all that goes with it, who otherwise would not be able to,” said Rochelle Schlortt, Catholic Charities Chief Communications Officer. This article originally appeared on the official website of the Colorado Springs Sky Sox. Click here to view the original story. The Connecticut Tigers are proud to honor our military heroes once again this Veterans Day by offering a special “thank you” offer. For the second straight year, any current or former military member who comes to the Dodd Stadium box office on Tuesday, November 11, 2014 between 9 am and 5 pm will receive two complimentary ticket vouchers redeemable for a premium box seat to any 2015 regular season Connecticut Tigers game. The offer is only valid in person at the Dodd Stadium box office and some form of military identification must be shown. The Connecticut Tigers are the New York-Penn League affiliate of the Detroit Tigers and play a 76 game schedule that runs from mid June through early September. 2015 season tickets, and team merchandise are now on sale! The front office and box office is open daily from 9 am to 5 pm Monday through Friday and can be accessed in person or by calling 860-887-7962. Today the San Jose Giants announced and opened nominations for their second Military Trading Card Set, presented by Operation: Care and Comfort. The trading card set will again be made up entirely from fan nominations of current or former members of the military. Nominations will be accepted through Friday, December 19. All submissions must be accompanied by a photo of the nominee, in military uniform, sent to info@sjgiants.com. The sets will be given to the first 1,000 fans in attendance at the San Jose Giants Fourth Annual Salute to the Military Day on Saturday, April 18. Last year’s 36 member set included honorees from every branch of the military as well as a number of notable honorees: local icon, turned national news story Joe Bell and courageous war hero Pat Tillman. Click here to submit your nomination for the 2015 Military Trading Card Set. The San Jose Giants Fourth Annual Salute to the Military Day on April 18 will be part of the team’s 2015 opening homestand. The Giants will also host games at Municipal Stadium on Mother’s Day (May 10), Memorial Day (May 25), Father’s Day (June 21) and Independence Day (July 4). For more information on the 2015 season and ticket packages please visit sjgiants.com or call (408) 297-1435. The Gwinnett Braves have announced the recipient of their $1,000 grant for the month of October. Project Paws Alive, Inc. has been awarded the “Four Legged Friends” themed grant, aimed at funding an organization that benefits animals. The $1,000 grant awarded by the Gwinnett Braves will help Project Paws Alive in their local mission, providing protective equipment to the nine dogs in the Gwinnett County Police Department’s K-9 unit. Their goal is to raise $16,000, which will provide each K-9 with a ballistic/spike protective vest as well as a K-9 trauma kit. The holiday season is right around the corner, and for the third consecutive season the Keys will be partnering with Toys for Tots. The mission of the U.S. Marine Corps Reserve Toys for Tots Program is to collect new, unwrapped toys during October, November and December each year, and distribute those toys as Christmas gifts to less fortunate children. Members of the Frederick community can drop off toys at Harry Grove Stadium starting on November 5, from 9-5 p.m, Monday to Friday. 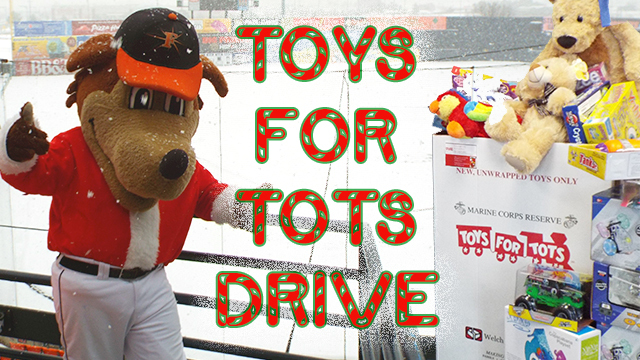 Anyone who donates a toy will receive two tickets to a 2015 Frederick Keys home game along with two Keys hats. The Toys for Tots Drive concludes on Saturday, December 13, when the Keys host their annual holiday event in the Mattress Warehouse Club. 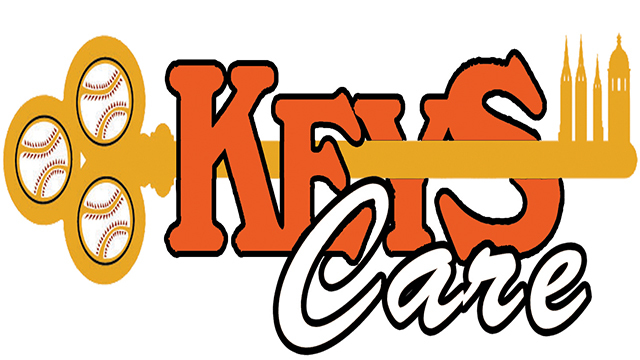 The Keys Holiday Event on December 13 will run from 10am-1pm. More details will be available at a later date. Ticket plans for the 2015 season are now available, and can be purchased by calling an account manager at 301-815-9900. Every plan comes with the choice of a Zach Britton or Kevin Gausman bobblehead. This article originally appeared on the official website of the Frederick Keys. Click here to view the original story. In honor of Veterans Day, the Sacramento River Cats are offering a special Veterans Day Ticket Package available only on Monday, November 10 and Tuesday, November 11 at Raley Field. The River Cats will have a media area set up both days to interview local military personnel about their service history. Footage will be used throughout the season to honor our troops’ service at home and abroad. This article originally appeared on the official website of the Sacramento River Cats. Click here to view the original story. It is with great pleasure that the Frederick Keys, Class A minor league affiliate of the Baltimore Orioles, announce the recipients of Frederick Keys Care grants for 2014-2015. The Frederick Keys Care Fund is a component fund of the Community Foundation of Frederick County. Joel Stephens played in the Baltimore Orioles’ minor league system until he lost his courageous battle with colon cancer in 1998 at the age of 22. The fund was established as the Joel A. Stephen’s Memorial Fund in 2002 to continue his desire to reach out to youth in need with compassion and encouragement. In 2011 the fund’s name was changed, with the support of Joel’s family, to The Frederick Keys Care Fund in order to continue Joel’s legacy and to acknowledge the Frederick Keys commitment to furthering Joel’s fund. Since its inception, The Frederick Keys Care Fund has awarded more than $53,000.00 to local youth organizations (including this year’s grant amount of $8,696.00). This year’s grant money will be divided among five projects for local nonprofit organizations. The Frederick Keys Care Fund is part of The Community Foundation of Frederick County’s Universal Grant Application funding program that takes place in the fall of each year. Nonprofit organizations that provide direct services to our Frederick County youth and young adults may apply on behalf of their programs. Members of the organization(s) who receive funding through “Frederick Keys Care” are invited to attend the luncheon following the annual Frederick Keys Charity Golf Classic to be recognized as the current Fund recipients and again on the field at Harry Grove Stadium prior to a Frederick Keys game as well as other activities that may seem appropriate. This holiday season, the New Orleans Zephyrs are again partnering with Toys For Tots, with Zephyr Field providing an official drop-off location for toys to be given to needy children in the community. As sponsors of the Toys For Tots program, new, unwrapped toys can be dropped off at Zephyr Field through Friday, December 12. Those toys will be delivered to less fortunate children in the community as Christmas presents. The Toys For Tots program accepts only new, unwrapped toys. Toys For Tots campaigns are conducted by the U.S. Marine Corps Reserve in approximately 500 communities in all 50 states, the District of Columbia and Puerto Rico. Baseballtown Charities would like to thank Wells Fargo’s Community Connections Giving Program for their donation of $1,000. Through the program, Wells Fargo’s retail banking stores explore the needs of their local communities and select a nonprofit organization to receive a grant. This year, Wells Fargo will award close to $300,000 in grants to nonprofit organizations and schools across Pennsylvania. The grants are part of the company’s broader support of its communities. In 2013, Wells Fargo invested more than $14 million in nonprofit organizations and schools and team members volunteered more than 46,000 hours throughout Pennsylvania. 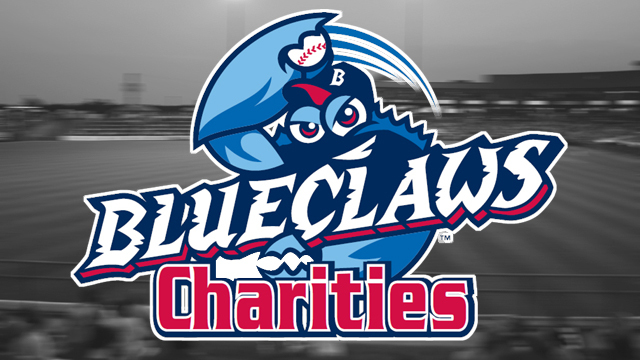 Baseballtown Charities, a non-profit 501 (c)(3) entity, was founded in 2002 in association with the Reading Fightin Phils in order to keep baseball alive in Reading through charitable donations to underprivileged youth who otherwise wouldn’t have the opportunity to play baseball. The organization also pays tribute to Reading’s rich baseball history. Perhaps the biggest accomplishment the organization has overtaken was the construction of Gordon Hoodak Stadium at Lauer’s Park in 2006. Through contributions exceeding $900,000, the youth ballpark was built in a neighborhood that is quickly returning to its glory days. It sits on the grounds of Lauer’s Park Elementary School, named for the former stadium where Babe Ruth and Shoeless Joe Jackson both played. The original housed several professional teams and hosted barnstorming tours from 1907-1941. Reading’s own baseball legend, the late “Broadway” Charlie Wagner, former Red Sox pitcher and roommate Ted Williams, began his career there.